Arthur Vigil is the grandson of Manuel and Vicenta Vigil, a noted pottery-making husband and wife team from Tesuque Pueblo. Manuel is credited with making the first pueblo pottery nacimiento (nativity) in the 1950's. 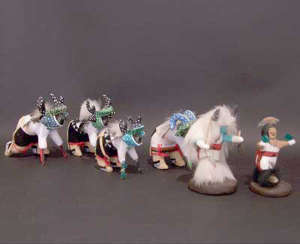 As a team, they were famous for their figurines, including storytellers, dancers and nativities. Their grandson Art has also earned a name for his pottery figures but as much as he emulates their process, he's developed his own personal style. He doesn't make much pottery any more.